Potassium ion (K+) channels are ubiquitous components and are widely distributed on the surface of the cell membrane in various tissues. There are many types of potassium ion channels (voltage-gated K+ channels, ATP-sensitive K+ channels, Ca2+-activated K+ channels, etc. ), and each type of potassium ion channel has its own characteristic features concerning electrophysiology and molecular biology in each potassium ion channel. The potassium ion current across the plasma membrane is considered to have two main physiological functions, one for determining the membrane potential and the other regulating the electrical activity. Membrane hyperpolarization would reduce the excitability of the membrane by shifting the membrane potential away from the threshold for excitation and would inhibit, where it existed, calcium ion (Ca2+) influx through voltage-gated Ca2+ channels by closing the Ca2+ channel. Outward potassium ion currents activated upon depolarization would counteract the depolarizing action of inward currents carried either by sodium ion (Na+) or Ca2+. Therefore, potassium ion channels show the physiological effects in each tissue via membrane potential mediated Ca2+ dynamics (for example, excitation-contraction coupling in muscle). Potassium ion channel activity is also essentially regulated by the intracellular signal transduction pathways, such as receptors’ (G proteins) second messenger molecules processes in the physiological condition. On the other hand, the modification of potassium ion channel activity would be expected to have a significant effect on the excitability of various cells. Therefore, augmentation of outward potassium ion currents may be useful to treat various diseases (asthma, chronic pulmonary obstructive disease, hypertension, diabetes mellitus, glaucoma, arrhythmias, heart failure, epilepsy, etc.). Furthermore, potassium ion channels may be a target protein for the research and development of a therapeutic agent for various diseases concerning the lungs, heart, nerves, eyes, and pancreas. 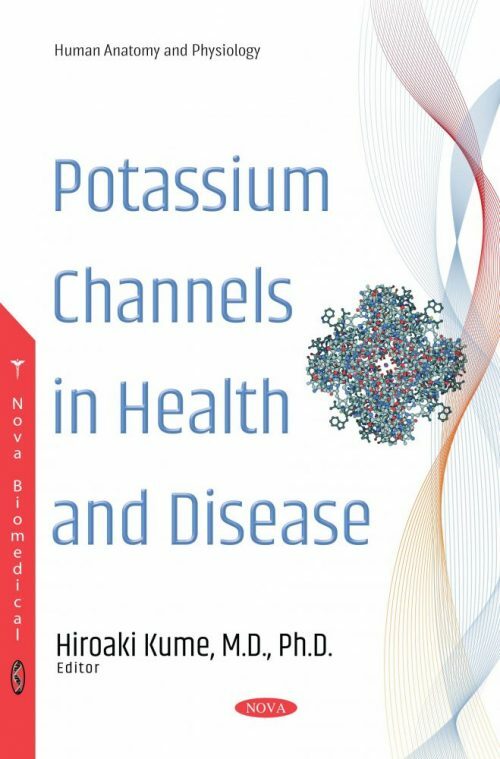 However, there are few books described in detail about potassium ion channels. This book will focus on the characteristics, function and regulation of several types of potassium ion channels, focusing on the role of these channels not only in terms of physical responses, but also in the aforementioned diseases.